strobe | Photography, Storytelling, & Growth Marketing by Matthew Woodget. I’m becoming more and more aware of my limitations and opportunity to grow as a photographer. I’m imagining what the 2012 daily challenge will be; perhaps everyday as a portrait. This is a rather scary thought considering the days where it approaches 11pm and I realize I’ve not got a photo for the day yet. The next level of detail on number 2. A thought that comes to mind; in a National Geographic book of beautiful photos there is a mention on how photography is all about what is taken away. What isn’t included. The “frame” being the most important part of the picture. I let me mind wander on this; the physical frame (wood, metal, etc. ), the act of ‘framing’ the photo, and the border of the photo after which nothing else is seen. I loved it and it really resonated with me. I was glad to get the flash out this week and experiment with some water shots. 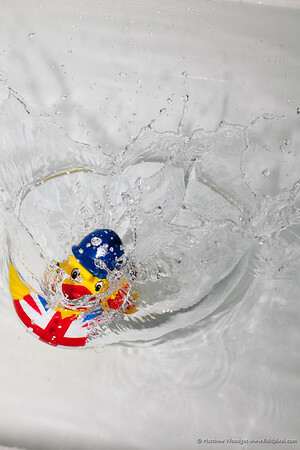 After we bathed our son I had some ideas about ‘splash shots’. My first attempts that evening of a bulb (shutter open) shot with multiple flashes didn’t quite pan out > I’ll be working on that. Below was a good old fashioned moment in time shot. I love how the eyes poke out from under the water. Click the ducky to jump to the rest of the past few weeks photos. I’m starting to experiment more with strobes (flashes). As a result I found this amusing shot with my son. 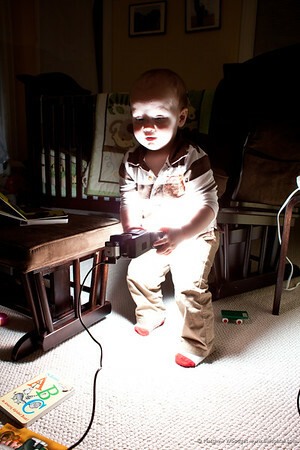 Good flash resources over @ The Strobist.